In this week's reading, the migration focus on Robert Joseph Pershing Foster is especially presented in detail in comparison to the other narratives in the book. Foster’s migration trek seems to present elements of foreshadowing and heavy metaphors in relation to the subject of oppression and progression. The text states, “He had just come out of the desert in every sense of the word, and the details of his future were too much to think about right now. He drove north toward whatever awaited him” (216). How, in brief, did Isabel Wilkerson’s references to deserts, forked roads, or never-ending darkness affect how you thought about Foster’s travels or migration in general? Isabel Wilkerson's references to deserts, forked roads, and never-ending darkness added a lot of detail into my thoughts. Doing this made me feel as if I was there with them at that time because she described it so vividly. On top of that, it also made me think about how scary it had to been. Not only were they out of their element, but he also was not that good of a driver which added to the danger. I think what readers can gather from this is that the rode to "Paradise" was often a lonely and disappointing one. As well as a scary and dangerous one. Isabel Wilkerson's reference to deserts, forked roads, and never-ending darkness really made me think about what she is really trying to convey to the readers. I think even more so than describing the horrific journey, it is also a metaphor for: Your journey is not always going to be a happy one or a fun one, but once you reach your destination, it's going to be glorious. You have to be strong, courageous, and patient until you are where you want to be. I think knowing what our ancestors have been through gives us motivation to succeed in live today. 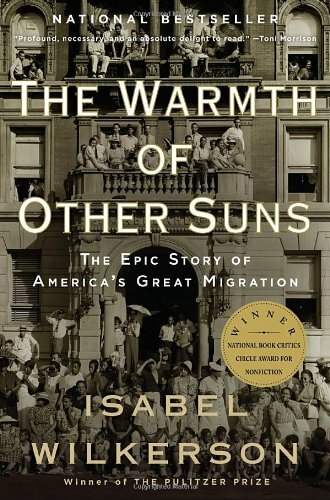 Isabel Wilkerson's references to deserts, forked roads, and never-ending darkness helped me create a vivid image of migration in general. These terms brought to light how unpleasant migration really was. Isabel made me realize that this journey had to be very scary and overwhelming for everyone choosing to migrate. Isabel Wilkerson's references to deserts, forked roads, and never-ending darkness helped me create a vivid image of migration. I felt like I could put myself into the story right next to him. I could feel his sense of fear of not be able to make and I could feel his hope of getting north and away from the desert. I could also feel the pain of all that he went through and is still going to have to go through until he reaches. The words were able to capture a vivid sense as well as an emotional journey of him. Isabel Wilkerson’s references to deserts, forked roads, or never-ending darkness showed me a different way to imagine the migration. The references were vividly explained, that it allowed to be right there next to them in the long journey. I could imagine the heat from the sun beating down on my face, the worrisome tiring roads that felt like the would never end, and the scary night sky, unsure of our destination. Isabel helped me envision not only the destination, but the journey. The references to deserts, forked roads, and never-ending darkness were great bouts of imagery through this section. To me, it helped mold the idea that although Foster was on his way to a better life, the journey itself had the potential to be filled with obstacles. Those obstacles might make Foster (or anyone migrating) want to turn around because they could start to believe that things would not be better in the new area (never-ending darkness). It also makes me think about the bad aspects of the migration. For example, people are removing themselves from a life that they have always known to something that may not prove to be much better. I'm sure that was scary for anyone migrating. Isabel Wilkerson’s references to deserts, forked roads, and never-ending darkness has definitely changed my perspectives on the migration. It has helped me to understand just how difficult this journey was for each individual, through the creative usr of similes and metaphors. These metaphors helped me understand the hardships that people faced, however it also, in a way, tells readers to keep hope. Isabel Wilkerson's description of the desert is stunning. The amount of detail put not only in describing the scenery but the journey as well made it feel as though it were me walking in it. Jim Crow laws were followed almost religiously back then. I found myself smiling when he was able to meet the white woman whose husband said, "We're from Illinois." The amount of emotions, displayed in just the first few pages makes me curious over how this entire book will end. The reference to a never ending dark road was very strong in its affect on me. The imagery of a difficult journey with no end in sight. I think about how hard it must of been to make this journey with only the hope that things will get better. Wilkerson’s references to deserts, forked roads, and never-ending darkness were all symbolic and emotion evoking to me when i was reading. The endlessness of the desert, to me, seemed to represent a sense of uncertainty to Foster, as he was unaware of what he would find in the distance and the further he went the more he realized that just making the journey would not change the way the world thought of him as a colored man. It wasn't the distance that needed to be traveled that was the hard part, it was taking the leap of faith and trying to believe that things would be better if he strayed from his current path of life in the deeply racialized south. I think the darkness heightened the sense of solitude Foster was experiencing. The darkness could have also represented the diminishing hope that Foster had, considering the darker the sky became, the more down on his luck he seemed to be. I think what Wilkerson was trying to get the reader to see was that the path to a better place is not always a happy one. There will be obstacles, times when you want to turn around, and times you will be terrified about what lies ahead of you but you have to keep pushing forward. I enjoyed reading about the desert, the roads, and how they intertwine with the idea of being in a white mans world such as "he never intended to March over Jim Crow or try to integrate anybody's motel," leading up to the absolute darkness. It's boggling to me because I could not picture myself in these situations and I find that there are constant metaphors and analogies to other historical points. Wilkerson reference to desserts, forked roads and never ending darkness makes me think more on his migration, from the jump I always knew that it must of been hard and a dangerous journey but a journey that he wanted to complete so her description just strengthens what I was already sure of but it does make me think that even though the journey was horrible, the tunnel at the end of the road is all that matters as long as they reached it. Wilkerson's references to Robert's journey from the south gave a lot of description, imagery, and even metaphors. The description and imagery allows readers to imagine the physical journey that the character had to endure. But I think certain parts of the journey which were obstacles for the characters can also be seen as obstacles for black people in general. One physical obstacle Robert faced was the darkness and not knowing exactly where he was going. I believe this can relate to many of the black migrants because they were brave and willing to travel to another part of the country in "the dark" even when they were not exactly sure of what fate it would bring. They just had to be trusting that wherever they ended up would be better than where they came from. Isabel Wilkerson's reference to desserts, forked roads and never ending darkness were described in great detail, like it almost painted a picture. The words described an emotional journey for readers where one could sense the fear and pain that he endured on his journey. It made you think about hard the journey was for those who went through it. This was a great read and I can't wait to keep reading. Wilkerson's references to deserts, forked roads, and never ending darkness really elicited a feeling of loneliness in me. The comparison to a desert with forked roads makes the journey seem like it was emotionally and physically exhausting. It is also a testament to the strength and bravery needed to pursue and continue on this journey. Wilkerson's references to deserts, forked roads, and never ending darkness drew me in closer to the story. I love geography and I thoroughly enjoyed the way he described driving through Arizona. It drew a vivid picture in my head. 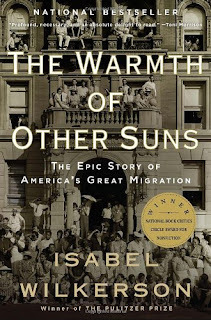 Isabel Wilkerson’s references to deserts, forked roads, or never-ending darkness really put an image in my mind of what the great migration was really like. I always knew it was bad for African Americans during that time period, but the metaphors helped me to better understand what they were going through. They knew that they were leaving a terrible area, but they did not know what the future held or life would be like on the other side. It saddens me to think about the fear that undermined their relief. Isabel Wilkerson’s references to deserts, forked roads, or never-ending darkness made me realize just how lonely and depressing the journey really was. Before reading this section, I knew that the journey was very long and disappointing, but I had the chance to actually feel Foster's pain. What really made me think differently about the migration was how mentally exhausting it had to be. On page 205, it talks about how it makes it seem like they are moving and yet standing still at the same time, it makes it seem as if they are going crazy. Mentally exhausting is almost an understatement here. Isabella really translated Pershings feelings of being a fish out of water nicely. I could feel Pershings anxiety in being so far away from home and alone in the middle of the dessert. It was like the desert had become its own beast, one that Pershing had not even anticipated. The worst part was how he could not go back because of the ridicule he would face and the money he already invested. The vivid description that Isabel Wilkerson provided about the migration made me feel as though I was with them. It seemed like an agonizing journey that would just make many people want to give up and end it as quickly as possible. It's an emotional and exhausting journey that one must go through. Isabel Wilkerson’s references to deserts, forked roads, or never-ending darkness helped create a portrait of what the migration was. It was a path that Foster did not know was at the end. It seems this was Wilkerson's way of describing how Foster felt mentally about the situation. The entire process was unpleasant. The way Wilkerson talked about the desert was like it was never going to end. Robert had been on such a long journey already even aside from the 1500+ miles of travel. The way she talked about never ending darkness made me feel as if Robert's journey was going nowhere than where he had already been. He was so scared that his California dreamland was going to be just like the Jim Crow south and I am still scared for him. Isabel Wilkerson's references to deserts, forked roads, and never-ending darkness made it easier for me as a reader to feel the mood and create a vivid image as she describes his journey. She made it clear that although his journey was not easy or as beautiful as the overall idea seems, the ending result is well worth it. "Deserts, forked roads, and never-ending darkness" implies a sense of eeriness. There is no comfort, happiness, or peace associated with that phrase. Deserts are a lonely, dry place uninhabited by the human race. Forked roads symbolize decisions; some will go one way and the rest another; perhaps never to see one another ever again. Never-ending darkness is a representation of impending doom or the constant unknown. These words combined made me realize what a scary and unpaved journey Wilkerson was describing. MY view on migration has changed from a fairly positive outlook to a much more leery and sympathetic nature towards immigrants. Wilkerson’s references to deserts, forked roads, or never-ending darkness allowed me to visualize the scene and imagine what Robert Joseph Pershing Foster could be thinking or feeling. Foster had no idea what he was doing or where he was going he just knew he needed to head North. The amount of courage Foster showed was amazing. He just trailed through deserts and into the darkness because he knew something better was awaiting for him on the other side. He never gave up and went through the hardships to get where he wanted to be. I believe that Wilkerson's descriptions of darkness, forked roads, and deserts were trying to create a tone of uneasiness within the reader. All of these things can signify conflict or obstacles that need to be overcome. Darkness can symbolize being lost and not being able to understand what is going on around you. It can also symbolize a fear of the unknown. Forked roads can symbolize confusion on what choices to make. Deserts can symbolize isolation. This made me think that migration was much more difficult than I've been lead to believe in the past. I have a much greater respect for immigrants now. Wilkerson’s descriptions of darkness, deserts and forked roads were ambiguous. They physical descriptions and use of imagery allowed me to put myself in his place. However, the descriptions were also symbolic. His struggles with the physical road to the North are a representation of the overall struggle colored people faced with the migration. The migrants knew they wanted a better life even if they did not know how to reach it and even if it was a difficult journey. The way she's discuss the travel shows that it was hard work to find "Paradise." Many African Americans would travel North in hopes that they would find land where they would be able to prosper and move forward to become better citizens for themselves and not worry about paying of debts that would never be paid off. Those hopes were hard to reach and no matter how hard some people would try they would feel like they were making no progress. Isabel’s physical descriptions of Foster’s journey illustrated the emotional struggles he was going through. The desert was used to describe the general hardships from the discrimination of the motel owners(207) to the lack of sleep while he was driving(212). The split road between San Diego and Los Angeles(211) symbolized the choice he had to make between continuing and turning back. The easiest path was chosen which was to keep going instead of turning back and having to listen to all the “I told you so’s”. The never ending darkness was realized when the store clerk warned him that California wasn’t the “paradise” Robert was hoping for(211). The way she describes the journey as a dessert filled with darkness shows the outcome of the journey. Though the journey is for the betterment of ones life no one knows the outcome of the journey. Unfortunately a lot of the journeys were filled with darkness especially with the creation of obstacles such as the urban ghettos. In the end, it makes one question if the journey is worth it. Wilkerson's descriptions of darkness, deserts, and forked roads really made me feel as though I was experiencing this journey with Foster. These descriptions also could also be a symbol of the emotional struggles he endured, which in turn can give the reader a feeling of what it was really like to experience this journey. I think these references helped readers imagine how long and difficult his journey would be. It would not be a straight shot to freedom as some people may think. The people who were migrating might have thought that as soon as they left the South they would be able to do whatever they want with their lives and that their children would not have to struggle like they did. Even though their struggles in their new land were different than where they came from, they were still great struggles that were not overcome by night. The reference to never ending darkness I would say affected me the most because although I cannot imagine going through what people in that time went through I do experience times where there seems to be no way out of a situation. All of the detail added by Wilkerson in her description of the Great Migration makes the reader feel as though they are actually there experiencing the moments with the characters. The great detail allows us to visualize what was actually happening and what these poor people were experiencing first hand.